Thousands of Yemenis have joined the “Life March” that began its 250 kilometers journey from Taiz to Sana’a on Tuesday December 20, due to arrive to the capital Sana’a to stage a demonstration in front of the Parliament on Saturday December 24. The “Life March” could be one of the longest marches recorded in history, but just as remarkable as the march, has been the complete silence of international media about this unprecedented event, including TV networks and newspapers in the Middle East, all of which have circumvented the importance of the event by simply calling it “peaceful rally”. To Yemenis and readers in the Middle East this is hardly a surprise: The revolution in Yemen has received hardly any coverage, even though hundreds of people were massacred, cities stormed and peaceful demonstrators attacked. For a country at the edge of breaking down, being one of the world’s poorest, with a long history of unrest and secession, continued strife in the north, and with millions and millions of firearms, the fact that the Yemeni revolution did not escalate into a civil war is one of the most remarkable and yet unheard of, successes of Arab Spring. On Saturday, the Parliament is scheduled to vote a law that would grant full immunity from prosecution to President Ali Abdullah Saleh and many senior officials, in compliance with the terms of the deal brokered by the Gulf Cooperation Council and signed by Saleh in November in Saudi Arabia. The Yemeni revolutionaries have made clear the aims of this peaceful march: Rejection of the deal brokered by the Gulf Cooperation Council and political compromises with Saleh, their adamant refusal to circumvent the goals of the revolution and to accept guarantees or amnesties granted to those who have looted and savaged Yemen for decades. Lastly they emphasized that the world show know that what is happening in Yemen is a revolution and not just a political crisis. In this spirit, they call for peaceful coexistence between all political and religious groups, to ensure true freedom for all of the Yemeni people. As it is often the case with Yemen, the march has not been without opponents and challenges: The ruling party has accused the opposition of inciting and funding demonstrations with the only aim of thwarting the GCC deal. They have called again for mediation by GCC and threatened to halt the march if not stopped. These accusations have been denied by the protesters. There is also a measure of dissent within the pro-democracy camp in Yemen and the support for the march is not univocal. It remains however true that the GCC initiative, while appealing to different players in the political spectrum, ignored the grievances of the Yemeni street and was not representative of them. It is not only the violence in the course of the revolution but the decades of destruction, corruption and oppression, that have driven Yemenis to seize the streets again and demand that Saleh and is aides be put to trial for their crimes. Justice being served to the people remains the real question for many people involved in Arab Spring, while political players and international bodies have played down the role of justice in effective political transitions. The case of Yemen is not unique: It was reported recently that in Tunisia, none of the victims in the course of the uprising had been acknowledged or compensated, and in Egypt, the crimes perpetrated by the Supreme Council of the Armed Forces on the Egyptian people continue unmolested while vocal activists and critics of the regime remain imprisoned on fictive charges. The march that began in Taiz with a few hundred people has been joined by many along the way and already numbers thousands. The marchers have already crossed over 150 kilometers and reached the city of Dhamar, where they were welcome with lunches and greeted by a march from the whole Thamar province. 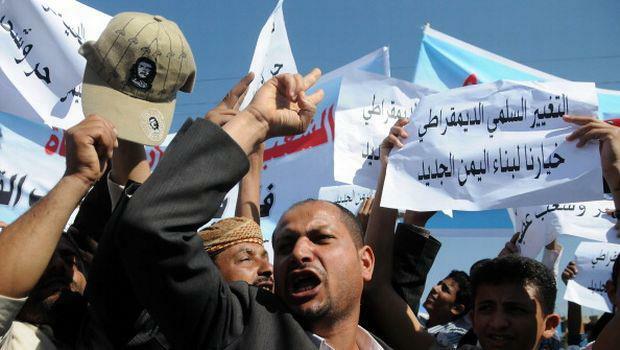 The protesters have also been joined by marches coming from Aden and other places in Yemen. It is reported that two groups of women have arrived from Taiz to Dhamar to join the march and already a third group is leaving Taiz to join “Life March”. It is important to notice that the role of women has been exceptionally prominent in the Yemeni revolution. Women’s contribution toward the revolution has been unprecedented and recently, Yemen Times, reported on a couple short films made in Yemen to highlight the transformation of gender roles in the course of the revolution. Saif al-Shara’abi, a Yemeni expatriate in the UK, commented on his blog about “Life March” saying: “This is a trek of 250 kilometers through rugged mountainous terrain by people who have been in revolt for 10 months, who live on 1000 calories per adult and nearly a third go hungry every day. Yesterday it was reported that there were armed groups preparing to attack the peaceful march. The sources stated that the armed groups have been deployed along the direction of Dhamar and in the vicinity of the capital Sana’a, ready to attack the demonstrators on their way to Sana’a. So far no attacks have been reported, the revolutionaries are well informed and in the words of Abdulkader Alguneid, “rogue elements have been exposed”. It is necessary here to highlight the strong symbolism of the march in the complex cultural map of Yemen, in which Taiz has always remained one of the main targets of Saleh’s violence and has refused to submit to the dictator. Writing for the Facebook page “News of the Yemeni revolution”, Atiaf Alwazir, a Yemeni research, stated how “The Life March has revived hope that peaceful resistance is still possible even after ten long months of protest. In the many cities and villages protesters have passed through, they have been welcomed with cheers, music, food and shelter. Along the protest route, many have also joined the march… By fostering new forms of resistance, Taiz city has become a symbol of innovation and inspiration in Yemen. This trend has continued with the Life March, making people feel proud and hopeful once more”. In the meantime, while international media keeps silent about this major turn in the Yemeni revolution, social media users have been very active with blogs, Facebook groups created to document the march, and a live stream has been set up for people to follow the protesters’ journey. In an unprecedented move, the Yemeni protesters have embodied the idea of peaceful resistance as a form of political power that was elaborated by Hannah Arendt in 1952 with Ghandi in mind: “Power always grows in between men, whereas violence can be possessed by one man alone. A modern example of how power helped to destroy violence is Ghandi. He never advocated for an impotence of the Christian kind. He rather thought that the power of the masses in India is the only thing that could bring British violence to an end”. Please, don't give up with your writing. Believe it or not, You are making a difference. I know things now that I was not aware of . Your blog came all the way to Florida. Your comments are very, very kind! Thanks!